Description The attempt at flight by Paul Cornu, is recognized as the first 'helicopter' flight, since his effort was the first time that a vertical flying machine was able to make a short hop of about 20 seconds, hovering at about 1 foot, without human assistance. The aircraft was powered by a 24 horse power engine, but had no effective means of control. Its exact achievements can, however, be questioned when looking at the scientific analyses which exist. Nevertheless, Cornu was on the right track, and must be recognized as a true helicopter pioneer. 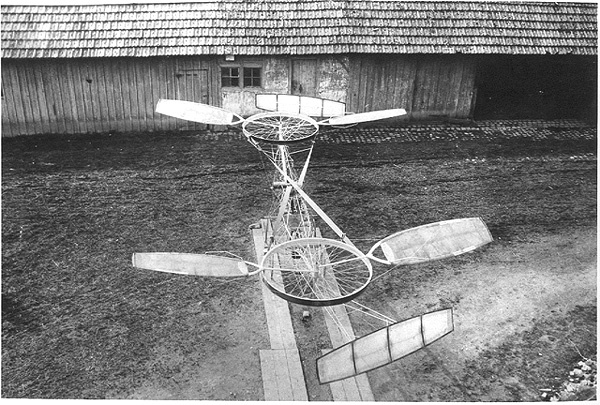 The attempt at flight by Paul Cornu, is recognized as the first 'helicopter' flight, since his effort was the first time that a vertical flying machine was able to make a short hop of about 20 seconds, hovering at about 1 foot, without human assistance. The aircraft was powered by a 24 horse power engine, but had no effective means of control. Its exact achievements can, however, be questioned when looking at the scientific analyses which exist. Nevertheless, Cornu was on the right track, and must be recognized as a true helicopter pioneer. Do you want to comment the Paul Cornu Helicopter helicopter?